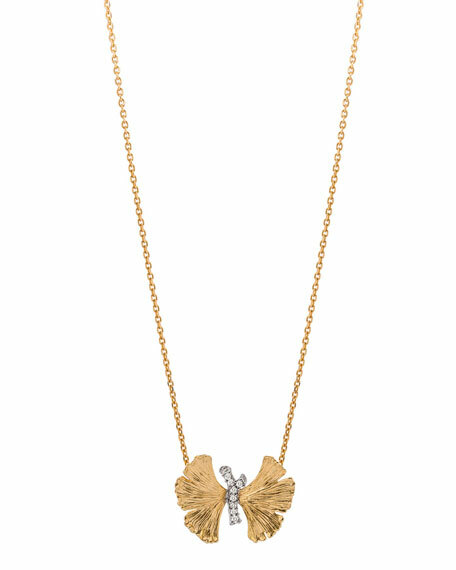 Michael Aram necklace from the Butterfly Ginkgo Collection. Textured sterling silver and 18-karat yellow gold hardware. Integrated ginkgo-wing butterfly pendant with white diamond pavé. The Michael Aram Butterfly Ginkgo Collection is a poetic collection which tells the story of the delicate balance between flora and fauna, with the leaves and twigs of the ginkgo tree metamorphosing into butterflies taking flight. The piece is inspired by leaves that would blow into Aram's bedroom window from the ginkgo tree growing curbside outside his New York City apartment. The leaves seemed like a delicate gift from nature in an otherwise hostile urban environment, and especially meaningful as the ginkgo tree is associated with wellness and healing.